These high quality 24pt 100% recycled chipboard covers are an ideal solution to give rigidity to your documents, reports, presentations, and proposals. 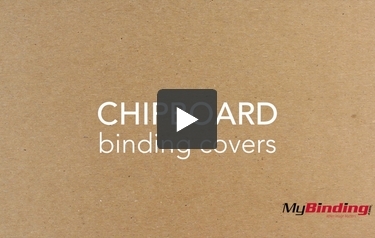 These 24pt chipboard covers are often used on the back of notebooks and can be wrapped, painted, die cut, stamped, or punched for virtually any project. We do recommend ordering these 24pt recycled chipboard covers pre-punched (see drop-down menu above) as they can take a toll on smaller binding punches. High quality, perfectly suits my needs! Great product, came exactly as described. Fast shipping and the printing was clear and correct. I will continue purchasing from mybinding! Also exactly what I needed. They are easy to cut but they are not to flimsy! Perfect Review by Shannon D.
Exactly what I needed. Not to flimsy and not to heavy!